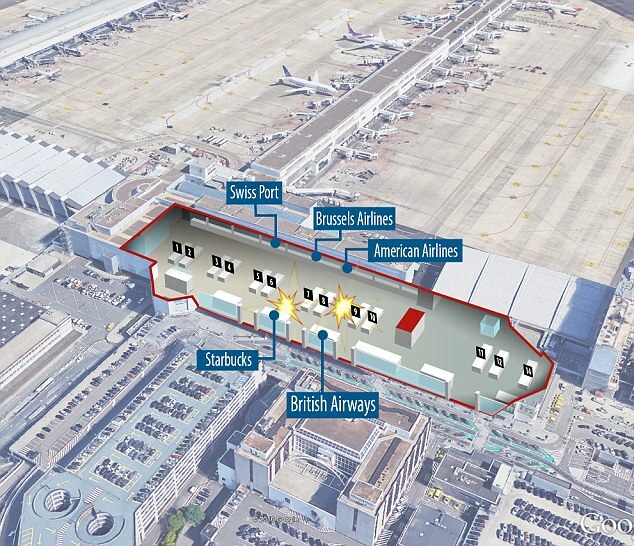 Two explosions rocked the departure lounge of Zaventem airport in Brussels yesterday morning and, one hour later, another explosion occurred at the Maelbaek metro station. Reports indicate at least 30 have been killed and another 230 injured in the blasts. The incidents are being called acts of terrorism and most reports have been careful to note the discovery of an Islamic State flag in a police raid in the Schaebeek district of Brussels that (we are told) is related to the attack. One man has now reportedly been arrested in connection with the incident and two brothers–identified as Khalid and Brahim El Bakraoui–have been blamed for the apparent suicide bombing at the airport. As news and information continues to come in related to the attacks Corbett Report members are encouraged to leave links, information and analysis in the comments section of this post. This thread will be the basis for ongoing Corbett Report reporting on the events in the coming days. Note that the latter report references a meeting of top American and European officials, foreign policy “experts” and journalists held in Brussels just last week that apparently included predictions of just such an attack. The meeting was hosted by the “German Marshall Fund,” an organization I have not looked deeply into yet. If someone wants to start do some digging to find out more about the GMF, its activities, and the meeting last week, that might be a fruitful avenue of exploration. It mentions a couple of the trustees and their connections. Not sure if this is helpful. ISGP.nl offers (as often) very useful data. Search these people (in the same page) to see in which they participate further leads to an interesting network of: NATO, Bilderberg, Trilateral Commission, military, Brookings Institute, Rockefeller Foundation, Banking, Pilgrims Society, etc. and then the Sadiq article which came in overnight. one by John Robb on the mechanics of disruption. Af-Pak and MENA regions, energy politics and Petroimperialism. “We have no clue yet,” the official told NBC News. individuals, the costs would be incalculable. between the major powers much more likely. I’m not sure if everything in that article can be believed. But don’t ask me which bits. Just found this little information and thought this might be a bit strange. What are the chances? I am of two minds with this recent horrific event but see a commonality to them both. The authorities are tying individuals of the Brussels attacks to the Paris attacks. The Paris attacks have had some controversy surrounding them as to authenticity as to whether these were staged by unknown behind the scene conspirators or as purported true terrorist attacks. So we can see the necessity for making this connection to lend support to the Paris events as proclaimed, if indeed they were some type of covert operation to further goals of secretive agents or not. The Brussels attacks, if we dare consider just about anything we encounter in the media as approximating truth, seem to be an escalation of terror events in Europe. Whether they are actual true blow back events is very difficult to ascertain or something plotted or allowed to take place is generally immaterial in the grand scope of things. What we do know is that these events are used by the agents of the NWO (I hate this acronym but it is concise) to further their agendas which are being implemented on so many fronts simultaneously. Be that as it may, this attack on the complicit citizenry of Belgium will be used to further lock down the E.U in aiding the financial-corporate take over of nation states to be replaced with a world wide structure of corporatocracy; administered by the western elite under police state governance. The masks used from behind which this cabal is orchestrating their operations are many and varied. The U.N IPCC-Agenda 21-Smart growth-AGW, which James has exposed so completely recently, is but one. Terrorism and human wave “bio weaponry” immigration is another. Corporate rights deals masquerading as trade deals add another. Plan out right overt and covert military, economic (sanctions etc) and internal interference (NGOs – diplomatic coercion etc) actions as in Ukraine and the Mid East and many other places constitute another action front. The orchestrated coming financial collapse poses another front. I could go on but why? The only respite seems to be the Russian Federation under the Putin regime as a dissident entity within the NWO-BIS system. With China’s elites it is very difficult to determine how her actions on the world stage are to be interpreted but my observation tends toward these Chinese elites straddling the fence waiting for the deal they want. Other nation’s elites also seem to be practicing a wait and see attitude. All the while the NWO is acting to break down the idea of nation states and to erase political boundaries as anti thesis to their end goals. Cultural shock for the peoples of these states will be traumatic and useful as human reservations come into view. However, unintended consequences are always a problem for the NWO that they must continually jump ahead of in order to steer towards their goals before the new tangent gets too far off course and begins to pose a real threat. One such is the growing popularity of politically far right nationalistic movements declaring cultural sovereignty, being a big part of their draw with the waves of culturally different people now taking place. As the NWO has a fascist structure these far right groupings will be easily assimilated with structural changes to societies under their control being made later as their leaders are brought into the fold one way or the other. So this is my thesis of how we get from the recent events in Europe and connect them to the overall planning. Whether theses attacks are honest events or not I believe really doesn’t matter all that much, especially to those caught in the bomb blasts and their friends and kinfolk. After all is said and done the proles in 1984 were blissfully ignorant and not totally unhappy in their existence. Only the Winston Smith’s of this world are at unease. Turkey’s Erdogan announces one bomber “Was caught in Turkey last June”. Turkey’s prime minister has said one of the Brussels attackers had been caught in Turkey in June 2015, and deported to the Netherlands by his request, according to Reuters. transatlantic relationship between the U.S. and Europe. …but I could not put up with all U.S. govt propaganda spewing forth from everyone’s mouth for more that seven minutes. Well, that’s my little bit of digging…. Here’s a story about a guy who was a witness to the Brussels attack and the Boston Marathon bombing. The article says he was also near Paris in November when that attack occurred. Crisis actor? 15.33 hr On TV they said there was extra police at the Dutch border, BNR Business News Radio had a reporter there saying, “Police hanging against the guardrail and cars were only slow down a bit”. They found a Kalashnikov at the airport and nobody I heard reporting any shooting all day. I live in Paris and similar things happened after the Bataclan attacks. I was online on Facebook and this popup thing appeared and said ‘let people know you’re ok in the Paris terror attacks’. I had no idea what was happening so turned on the news – the attacks were just underway, there were apparently ‘hostages’ being taken at the Bataclan (though it seems the media quickly dropped that story) and yet there was this Facebook pop up already? Then I saw on the news that the Empire State Building and UK Parliament were already lighted up using the French flag’s colours, still on the very evening the attack was going down- which was a Friday night. How could such efforts have been co ordinated without prior arrangement? So far two cases of fake videos: can we trust the mainstream media reports concerning the Brussels terror attacks? A friend told me about the explosions in Belgium, I didn’t want to click on to it all day. But in the evening I looked @ some news sites, they were similar. It was only today I thought about it again, they were similar in that they emphasized the fact the explosions were close to the EU head quarters is that relevant? Suicide bombers or smallish explosions don’t decimate buildings. Why is that important? The explosion near the EU buildings occurred at “9:11” on the “22nd” of March. 11 of March in Madrid, 11 of September in the USA, now 22 of March in Brussels (and also 7 of July in London)… The only reason why you don’t see 33 appearing also is because there is no such day or month. The previous attacks in Paris occurred on “Friday the 13th” of month 11. The number of the flight that started the 9/11 attacks was 11. John F. Kennedy was killed on 11/22. Etc. Everyone that seriously looks at these kind of events cannot conclude that these are all just coincidences (https://www.youtube.com/watch?v=1Kk22CeJ2WY#t=5m56s). “The date 3/22 (322) is not only the emblem of America’s leading CIA-Freemasonic elite group, Skull and Bones…” Kevin Barrett. in this regard I stumbled upon a video which is supposedly taken in front of one of the airports entrances, shortly after the incident. Now, up until now I did not come up with any picture that would establish the number 33 to have been there well before the incident, so take this for what is worth. I don’t know for Brussels but for 9/11 it matches very well. Not directly relevant to the recent attacks in Belgium, but here’s a speech by Belgian MP LAURENT LOUIS in which he stands against war in Mali in January 2015, and exposes the international neo-colonial plot. Very interesting in retrospect. January 2013, not 2015 my apologies. It matters in the context of both the Paris and Belgium attacks. Let that one sink in for a minute. I could draw parallels and speak about the absurdity of such a find, but I think I’d be preaching to the choir. Saw a similar post about the Laptop in the garbage bin on RT. What are the chances of someone finding it, opening it, turning it on, knowing the password and finding the letter on it. Is this Brussels version of the passport being found blocks from the World Trade centres on 911? Top story in the Vancouver Sun on March 23, 2016 (http://www.vancouversun.com/news/daphne+bramham+afraid+should+terrorists/11805183/story.html). Looks like everyone in Canada has to now be vigilant in taking note of people displaying “unusual public behavior” and reporting these incidents to the police in case this behavior might somehow be correlated with terrorist activities! Some of these so called unusual behaviors mentioned include: 1) wearing a single glove, 2) wearing excessively bulky clothing 3) having an extra-large suitcase and 4) whispering into a cell phone. Part of me felt this article had to be satirical but sadly no. Rather, instilling fear in the population and normalizing snitching appear to be the article’s main objective IMO. I can only hope Canadians see through the drivel and continue to wear bulky clothing even if they aren’t headed to Saskatchewan in the dead of winter! JAMES!!! Brother you have to check this out!!! I found it last night, and it goes into some connections this ‘event’ has with a rich Jewish ‘business’ man with connections to an Oslo attack. Must see!!! There is a Thon hotel just at the corner. Thus, it must have been people who work there. What puzzles me more is why was the metro not stopped after the airport explosions (more than one hour before)? They paralyzed the city some months ago (metro included) and nobody thought about stopping the metro on Tuesday? By the way I was in the next metro which was one stop before Maalbeek, walked by Maalbeek station immediately after the blast and saw the horrendous scene. The first thing that’ comes to mind is, I wonder if an Israeli company manages the security at this airport because it has the Mossad’s fingerprints all over it. Glad you’re up and running again, James, as I have missed you this last week. Hope your new home is comfortable. Stay safe, our friend. indeed your suspicion may be correct, as the company that manages security for Brussels airport appears to be the former European division of the meanwhile infamous ICTS International N.V.
ICTS Europe was incorporated as a separate company in 1999 however, being acquired by Fraport AG, the owner and operator of Frankfurt Airport in 2002 so the connection up until this day is not very clear (at least from what I read). ICTS International appeared to have focused more on the American market, with its new subsidiary I-SEC handling aviation security in Europe. The German Marshall Fund was a breeding ground for journalists, university students and politicians totally devoted to the Atlantic cause until the collapse of the USSR. But, since the threat was dispelled, the Fund lost its ideological purpose. GMF is now a get together for some of the most influential U.S., European, and global political, corporate, media, and intellectual leaders to address pressing challenges currently facing both sides of the Atlantic. GMF staff and fellows have expertise in a wide range of subjects, from security to democracy and from energy to trade, and a wide range of regions, from North America to Asia and from Europe to the Wider Atlantic Basin. The association is registered under US legislation. Some of it’s partners are USAID, the Rockefeller Brothers Fund and Bertelsmann Foundation wich is a German multinational mass media corporation. Through Robert Rubin(and others) it’s linked to the National Economic Council (the agency that had to identify the targets for CIA economic intelligence operations),Goldman Sachs and ofcourse the CFR. Through Guido Goldman(you could say the founder) it’s linked to the World Zionist Organization. His teacher was Zbigniew Brzezinski and Henry Kissinger oversaw his PhD. Through Lee Hammilton it’s connected to the presidential commission on September 11,Homeland Security Advisory Board,CIA,DIA,Iran-Contras. Through Ronald D. Asmus it’s linked to ‘A Transatlantic Strategy for Democratic Development in the Middle East’,Radio Free Europe,CFR. Through Suzanne Woolsey, wife of R. James Woolsey it’s linked to the manipulation of of the Iraqi National Congress. Only topics/questions, no content/answers. And on/off record..? -Europe’s Multiple Crises: Where is the Way Out? -Moscow Rules: Can Russia Be a Reliable Partner? The teenager named Mason happens to be at the last 3 bombings. Next, we have ICTS who just so happened to work ‘security’ for almost every major bombing since 2001.. I have a few points to make which I don’t think have been previously covered. First – it makes no sense to use a suicide bomber to attack an airport. How difficult is it to leave a suitcase lying around and detonate it remotely? If you were an ISIS mastermind and you had a couple of suicide-ready jihadis, wouldn’t you direct them at a higher value target, of which Brussels is particularly well-supplied. The same point applies to 7/7 in London. Second – with regard to the arrest of Paris mastermind, from a security perspective, it makes no sense to make make such a public spectacle of the arrest. If he was indeed a terrorist mastermind, he should have been arrested discretely and then interrogated before his fellow-jihadis were aware of it. With regard to the explosions, the Daily Mail has the locations strangely close: http://i.dailymail.co.uk/i/pix/2016/03/22/14/32748AC600000578-3504058-image-a-1_1458657957574.jpg Wouldn’t highly trained suicide bombers make sure they didn’t set off their devices too close to each other? After 4 days, there does seem to be a lack of named victims. I haven’t even seen a list of nationalities. What I don’t understand is why no one is asking the obvious question whether the actual blow-ups were captured on CCTV. Surely there are cameras everywhere at the airport so they must have been. Why then do we only see one image and conjectures that these men are “believed to have been involved” in the attack? I don’t necessarily expect the investigators to release all relevant video footage to the media but I found it interesting what they do NOT claim – they do not claim that the reason why these three men are said to be the perpetrators is because of what the CCTV shows. Instead we have conjectures. Also the cameras must have captured someone leaving unexploded suicide vest and suitcase bomb and also throw some light on how a Kalashnikov was found next to the dead body of one of the bombers – all of these have allegedly been found there. The attackers couldn’t made their mind up on how exactly they were going to hit so they took a collection of weapons with them? In fact, they might have planned to bring even more stuff as it was also reported that taxi driver taking them to the airport said they couldn’t fit all their luggage into the car and they took some of it back home. “Many in Europe have preferred to occupy themselves with the folly of condemning Israel, labelling products, and boycotts. In this time, underneath the nose of the continent’s citizens, thousands of extremist Islamic terror cells have grown,” Akunis wrote on Facebook. The Committee of 300 has a major bureaucracy at its disposal made up of hundreds of think tanks and front organizations that run the whole gamut of private business and government leaders.one of which is the German Marshall Fund. Allits members are also members of the Club of Rome and NATO. The Committee of 300, although in existence for over 150 years, did not take on its present form until around 1897. It was always given to issuing orders through other fronts, such as the Royal Institute for International Affairs. When it was decided that a super-body would control European affairs, the RIIA founded the Tavistock Institute, which in turn created NATO. For Five years NATO was financed by the German Marshall Fund. I would like to highlight a blogger, who is a bit esoteric but seems to have an understanding of how the cabal works. He ties in many pieces of information from around the world to draw a picture of how the global stage is being setup for the hidden agenda. Freelance journalist(Fayçal Cheffou) arrested as possible third terrorist(supposedly the one with the hat in the picture). B. whereas for over 40 years this organization has eluded all democratic controls and has been run by the secret services of the states concerned in collaboration with NATO. C. fearing the danger that such clandestine networks may have interfered illegally in the internal political affairs of Member States or may still do so. D. whereas in certain Member States military secret services (or uncontrolled branches thereof)were involved in serious cases of terrorism and crime as evidenced by various judicial inquiries. E. whereas these organizations operated and continue to operate completely outside the law since they are not subject to any parliamentary control and frequently those holding the highest government and constitutional posts have claimed to be in the dark as to these matters. So the EU Parliament officially has the info and so does the MSM. Gladio created by US via SHAPE offially exists. US did not give information for the official EU Parliament inquiry during 90’s, only denied the exitence of Gladio. I’m not aware of any official EU follow-ups after that. How would one expect someone to know that?